Our Lucky wasn't so lucky the day he wound up at NYC ACC. He had been given to his owner as a pee wee puppy gift four years earlier, but, sadly, his Owner's personal problems imploded, and Lucky lost his cushy home. Owner surrendered dogs have the toughest time of all adapting to chaotic kill shelter life. The frenzied energy that permeates such a hostile environment often instills fear and anxiety. After living a quiet life with adult owners, Lucky did not make the transition to shelter chaos very easily. He is a reserved and shy boy, who had a bit of a breakdown during his intake process. His behavior was extremely fearful, and excluded him from the adoption program. We offered to take him into our Rescue, and let him decompress a little bit before we came to any behavior conclusions. Lucky is a tiny boy, eighing just 8 pounds. 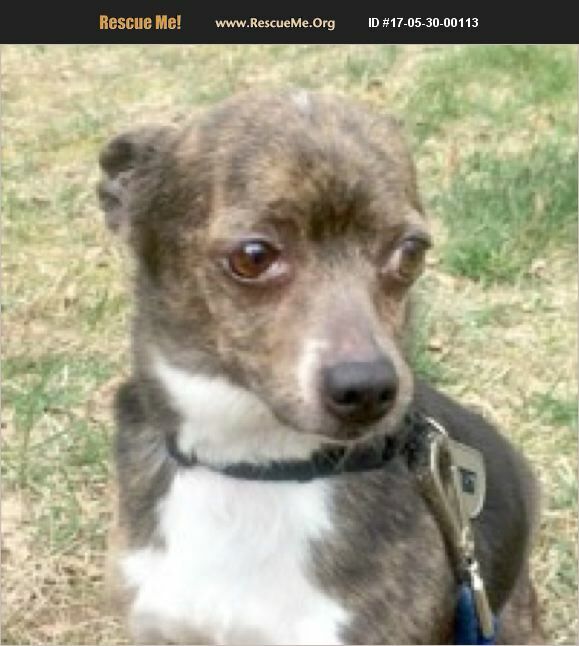 He appears to be largely Chihuahua, with an unusual saddleback coat pattern and brindle markings. He has a triangular, rather than apple-shaped head, with a broad skull and narrow, elongated muzzle. Despite his small size, Lucky has a thick, muscular build. We wouldn't be surprised if there was a little bit of a stocky breed like Brindle Boston Terrier or French Bulldog somewhere in his DNA. Lucky has adapted to foster care extremely well. Our initial goal was to build his resilience and confidence, so that he can move from situation to situation without fear. He's come along beautifully, although folks will have to go slow with him in the beginning, and let him warm up on his own timeline. Once Lucky relaxes, he is an absolute love and craves human attention. Lucky would be the ideal addition to an active single or adult home, with adopters who have some experience with shy rescue dogs. He may not give a Disney moment at the adoption meeting, but patient adopters will find Lucky to be absolutely magical in charm and character once he warms up. Adopters will need to be comfortable instructing family and friends to allow Lucky to approach on his own terms. Lucky is not high energy, and a couple of walks a day should be adequate for his exercise needs. He travels well and would love to tag along on adventures with his family. The more action and outings that Lucky gets the better. We don't think he'd be a good choice for families with small children, but he does get along well with other dogs and possibly cats. Lucky has not had much obedience training, so we are working on his basic commands, and he seems intrigued with the learning process. He responds to positive reinforcement and leadership training techniques. Adopters will find that ongoing obedience work is extremely helpful in building a shy dog's confidence, and establishing the necessary leadership, so that the dog feels safe in various circumstances. Lucky has good house manners, and is house trained and crate trained. Adopters should expect to troubleshoot the occasional accident that will inevitably occur during his transition to a new home. He has been neutered, and has been vaccinated for Rabies, DHLPPC (distemper, hepatitus, leptospirosis, parvo, parainfluenza, coronavirus), and Canine Flu. He has been boostered as needed. He has had the 4dx test: negative for heartworm, lyme, earlichia and anaplasmosis. He has been dewormed, microchipped and is on preventatives for Heartworm and Flea/Tick. If you are interested in Lucky, please write to Denise@eskiesonline.com or call Denise at 860-908-9738 for more info. Eskies Online is a 501(c)(3) Multibreed rescue group that serves unwanted American Eskimos and other dogs in need. Our group of volunteer foster homes spans the North East, and our adoption territory extends from Maine to eastern Pennsylvania, Delaware, and parts of northern Maryland. Once an adopter is approved, we arrange transportation. We do not adopt dogs beyond our territory. Please visit our website: www.eskiesonline.com for more information about our group and our adoption procedures.